Relastin Eye Silk wins Allure magazine’s “Best Anti-Wrinkle Eye Cream” award for the fourth year in a row! Relastin Eye Silk has received Allure magazine’s Best of Beauty Editors’ Choice award for the “Best Anti-Wrinkle Eye Cream” for the fourth year in a row, Revance Therapeutics Inc. announced today. a visible decrease in fine lines, coarse wrinkles, undereye laxity, puffiness and dark circles after four weeks of Eye Silk application. It is not only the top choice among top beauty editors, but also with dermatologists and consumers seeking a simple, yet effective skincare regimen and more youthful looking skin. “My patients come in looking for a significant decrease in their undereye wrinkles. 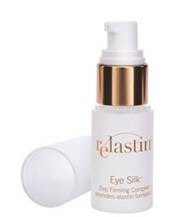 So far, Relastin Eye Silk is one of the only products I've seen that improves skin elasticity in this area. Lines are visibly smoother and skin effectively maintains its elasticity over time, making this product a great adjunct to cosmetic procedures,” said renowned dermatologist Dr. Jessica Wu. Eye Silk and the entire Relastin product line is available at http://www.relastin.com/ exclusive online retailers and select dermatologist offices and spas nationwide.